The best team in South Korean baseball traded for last year's saves leader on Monday, hoping to bolster a shaky bullpen with an eye on the championship. 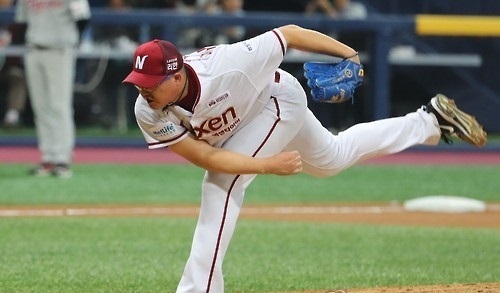 The Kia Tigers in the Korea Baseball Organization acquired right-hander Kim Se-hyun from the Nexen Heroes as part of a four-player deal. The Tigers, in first place with a 63-33-1 (wins-losses-ties) record, are also getting outfielder You Jae-sin and sent two left-handers, Son Dong-wook and Lee Seung-ho, the other way. Kim, 29, is the principal figure in the deal. He led the KBO with 36 saves last year and had a 2-0 record with a 2.60 ERA in 62 appearances. He has struggled this season, going 1-3 with 10 saves and a 6.83 ERA in 27 appearances. But the Tigers are hoping Kim can recover his old form and give more stability to the bullpen that has posted a 5.84 ERA, second to last in the 10-team league. The Tigers said Kim will slide in as a setup man before the current closer, Kim Yun-dong, and You, 29, will be a backup outfielder. They're going for their first KBO championship since 2009. The Heroes are still very much in the playoff hunt, holding on to fifth place, the wild card spot, at 51-46-1 and sitting only 2.5 games out of third place. But they traded for the future. Son, 27, has only 13 KBO games to his credit, all of them coming in his rookie year of 2013. He's been pitching in the Futures League, the KBO's minor league, this season.